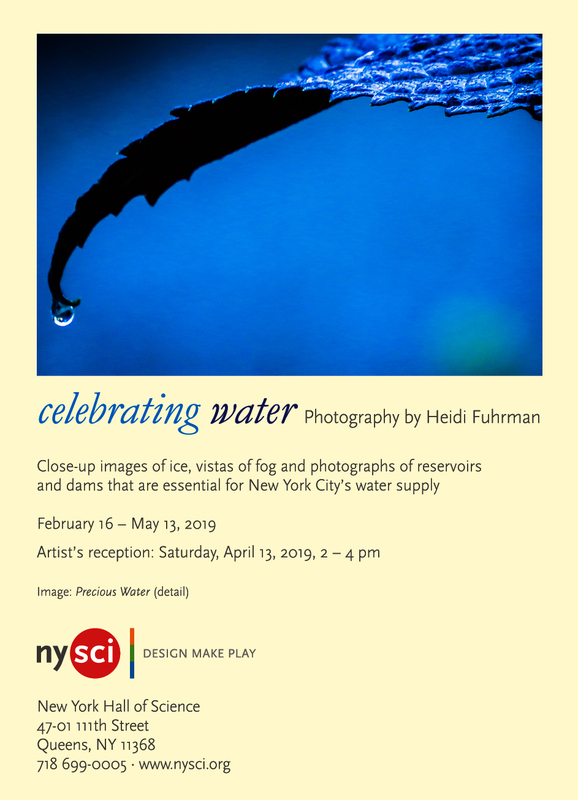 The New York Hall of Science, a large NYC museum on the grounds of the Worlds Fair and US Open tennis, has installed a 3-month solo exhibit of CCCW President Heidi Fuhrman -- featuring 50+ prints from Heidi's collections of ice, fog and macro images, all in celebration of "water," in its diverse forms, as a vital resource for humanity and the world. The exhibit opened on 2/16 and runs through 5/13. See the NYSCI Announcement below, and the NYSCI website for more information. The Museum is hosting a wine/cheese Reception on Saturday 4/13, 2-4 pm. Heidi invites all CCCW members (and their guests) to the Reception. For that event, the Reception -- and the museum -- is free for Heidi's guests. PLEASE REGISTER so Heidi can add you to the the Museum guest list. Bring up to 3 guests (consider bringing children/grandchildren, who will love this museum). FYI -- There is more to see in addition to Heidi's gallery. For example, in the next gallery, the museum has mounted a contrasting solo exhibit -- a collection of super-size black & white prints from a photographer in the Adirondack region. And the museum has amazing permanent science-themed exhibits. And, in addition to coming to the Reception, and exploring the Museum, Heidi encourages members to plan some time for street photography and eating -- e.g., the Worlds Fair grounds and Flushing restaurants. There is plenty of parking at the Museum. If you do not visit on the free Reception date, you can attend the museum for free on Saturday mornings. Check the NYSCI website for details on Heidi's exhibit, directions, etc.